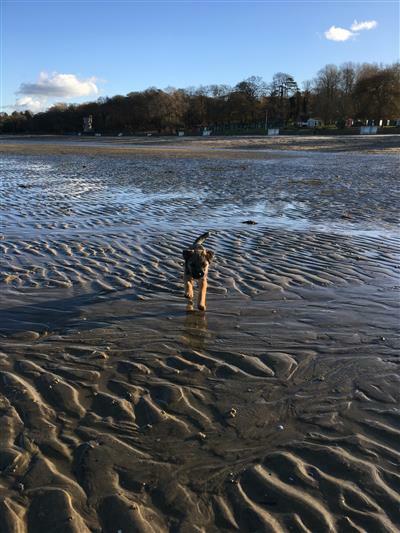 I've really got to know Ryde quite well now and love being able to go out on the beach and meet all of the other dogs and their monkeys. I also like to go to some of the local places where these monkeys hang out, there are a few of them that are great to walk to if your monkey only has a half in each! It works out at about 4 to 5 miles walking from Ryde to Seaview and back. Situated opposite Ryde Esplanade station and close to all transport links. Serves a good selection of treats for dogs, and real ales for the monkeys. They have a Christmas pug dinner this year. A doggy friendly hotel, the perfect place to stay if you want to come over and visit the Isle of Wight. Good food, I'm not allowed in the restaurant though. A nice seating area that gets the sun for most of the day. Restaurant on top (no doggies), and cafe below that has a license to sell alcohol. Monkeys are allowed on the beach all year round, but between 1st May and 30th Sept we are only allowed between Apply Tower and Dell Cafe. I've not been yet, but we have heard that this is a great place to be on Sunday morning with your monkeys! Another pub that serves good treats for dogs, and real ale. They have a nice looking restaurant for monkeys only, but a good sun trap garden for all. Has a nice seating area out the front, and serves good food in the restaurant. Doggies warmly welcomed every time I been in.